For those of us who have difficulty sleeping, passionflower tea may be the answer. It is highly effective and is gentle enough for children to drink. The tea is made from dried flowers, leaves, or shoots of the plant. Passionflower tea can be made by infusing 1 tablespoon of dried herbs in 1 cup boiling water. Let the mixture steep for about 10 minutes. It should not be combined with alcoholic beverages or prescription sedatives. You may also add lavender flowers, chamomile flowers and/or lemon balm leaves for an increased sedative effect. Passionflower is used in many herbal and pharmaceutical prearations. It contains seretonin which is believed to contibute to feelings of happiness and well-being. Passionflower is also a good remedy for anxiety, fear, panic attacks, and can be used to treat asthma, palpitations, high blood pressure and muscle cramps. 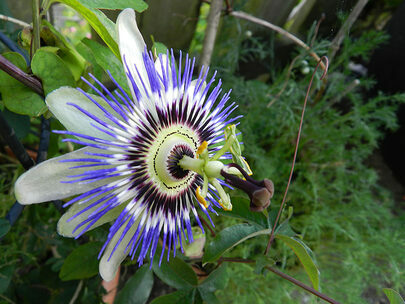 Passionflower also has pain killing effects and can help with tooth ache, and period discomfort. If you suffer from vertigo, dizziness, irritable bowel syndrome or irregular heartbeat, a cup of passionflower tea can help.